Rising to fame in the early 1960's, Phil Ochs' songs became anthems for peace and justice. With lyrics stripped straight from the daily headlines, Ochs spoke to those who hoped and fought for change. PHIL OCHS: There But For Fortune is a timely tribute to an unlikely American hero whose music is as relevant today as it was in the 1960's. 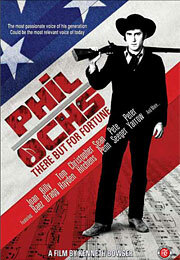 In the film, Joan Baez, Pete Seeger, Sean Penn, Christopher Hitchens and others reveal stories of Ochs' political passions. Today, his music lives on, influencing and inspiring songwriters around the world; artists such as Pearl Jam, Ani DiFranco, Billy Bragg and They Might Be Giants have covered his songs. Despite his tragic death in 1976, Phil Ochs remains an inspiration to those who aim to "fight the good fight." A film by Kenneth Bowser, PHIL OCHS: There But For Fortune is a portrait of the truth-seeking troubadour. Join us in the Clive Davis Theater for the Los Angeles premiere of this must-see documentary. Following the screening, producer Michael Ochs, peace and justice activist Tom Hayden (featured in the film) and director Bowser will discuss the making of the film. GRAMMY Museum Executive Director Bob Santelli will moderate.